We regret that your experience was not a great one, but understand that we have completed your installation. For future inquiries please contact customersupport@empiretoday.com. 4. Blame the whole horrific experience on you. 5. If you think Customer Service is your friend, FORGET IT. Find a HomeDepot, Lowes or a flooring company where you go in to pick out your product. 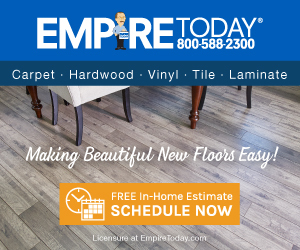 Stay away from EMPIRE TODAY FLOORING. Reason of review: wrong product, poor cust. serv.. Preferred solution: Install wood floor for price promised and paid.. I didn't like: Dishonest sales woman, Customer service and product was not what i originally chose. Review #858075 is a subjective opinion of User858075. We regret that your Empire experience was not a great one. We would like to follow up with you to discuss your experience in more detail and help make things right for you.